Regularly gracing the skies of Queensland and occasionly beyond is Rockhampton based Cessna 310R VH-FFA. One of two aircraft owned by J.M. Kelly (Project Builders) Pty Ltd and predominately used to transport company employees and contractors about the countryside, VH-FFA can often be sighted at different airports (more times in Central Queensland than not) wether only for a part-day, day or overnight visit. 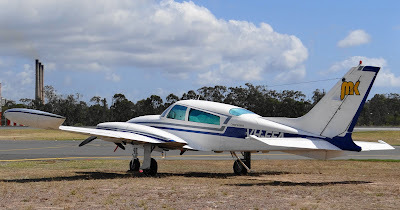 Manufactured in 1978 and powered by a pair of Teledyne-Continental IO-520, 6-cylinder engines, VH-FFA can accommodate 4 people (1 pilot, 3 passengers) in a simple but relatively plush cabin with leather covered seats.